Photograph of the Arhai-din-ka-Jhonpra Mosque in Ajmer from James Burgess' 'Photographs of Architecture and Scenery in Gujarat and Rajputana' taken by Colin Murray in c.1872. The Arhai-din-ka-Jhonpra Mosque was built around 1200 by Qutb-ud-Din Aibak. It is also called the 'Hut of Two-and-a-Half Days' probably after the duration of a religious fair that used to be held here. It represents an example of early Indo-Islamic architecture. The exquisite seven-arched screen in front of the main hall was added by Iltutmish in 1230. The building is composed of many reused parts from Hindu and Jain temples. 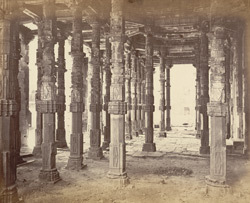 The pillars of the main hall, seen in this photograph, are constituted of three separate pillars from an earlier Hindu temple which have been assembled together. The ceiling of the prayer hall is made of corbelled domes carried on square bays.